Numerous blogs, web sites and newspaper articles have picked up variations of the "molecular gastronomic recipe" for making chocolate mousse with only chocolate and water first presented by Hervé This. However, most these recipes tell you to try-and fail. I have for some time felt that there is a need for making this recipe foolproof. This post is the first out of three on chocolate mousses: white-, milk- and dark chocolate. I've chosen to give recipes for mousses with added flavours rather than the pure ones. Hence, the recipe might not work out properly if other ingredients, or pure water, is used as liquid. The main reason for doing these experiments is that most of the recipes on the "molecular gastronomic mousses" tell you to try and fail until you're satisfied. That's ok if you are to serve the mousse right away. However, the mousse will firm up upon storage, starting after 1-2 hours. I want a recipe I can trust even when the mousse is kept in the fridge, not having to make it or repair it while the guests are waiting. Peel ginger, cut a 5 g piece (see picture) and slice as thinly as possible. Heat water to the boil, add ginger and steep for 5-10 minutes. Break chocolate in small pieces and put in metal bowl. Sieve off the ginger and discard. Add 0.5 dl (50 g, discard the rest) of the extract to the chocolate and heat while stirring gently until the chocolate in melted into an even mixture. Using a bath of hot water or gentle microwaving works fine. Move the bowl to the cold sink and start whisking, stop as soon as the mixture is no longer liquid but creamy. 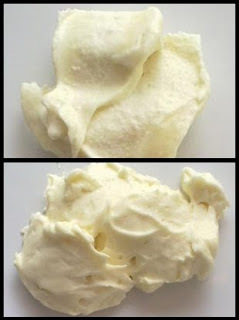 The mousse will not be light and airy, but rather a dense cream. If it becomes grainy, melt and whip again (might occur upon prolonged whipping, seemingly). However, if the texture is smooth to begin with you're most likely safe and it will stay that way upon storage. 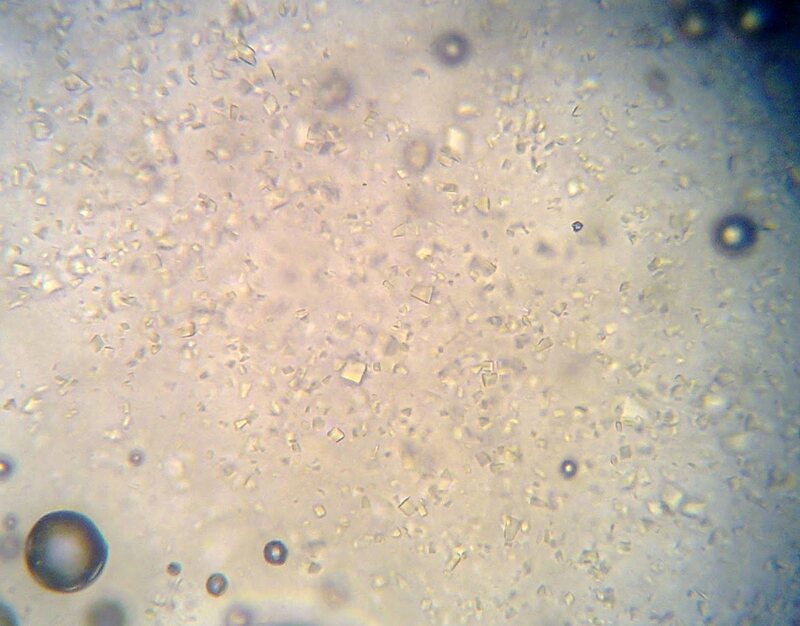 Tips: if measuring of small amounts of water/ginger is difficult it might be easier to make a larger amount of extract, say 2-3 dl (increasing the amount of ginger accordingly) and discard what is not used. The leftover extract is good on its own as a refreshing ginger tea hot or cold. Secondly: if using cold water bath, take care not to splash water from the bath into the chocolate (if so happens you have to start over. If you trust the water from the sink to be safe, you might melt the mixture, add some more chocolate and go for the try-and-fail tactic). The mousse is very sweet and creamy. The ginger flavour is very subtle with just a slight bite from gingerole and its relatives which give ginger its pungency. In my opinion, this mousse is too heavy and intense on its own. However, it is perfect accompaniment to tart desserts such as fruits/berries, or the strong flavours of darker chocolate mousses (see forthcoming posts). This mousse is quite dense. It is not very light or airy and feels almost like an emulsion rather than a foam. 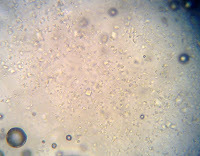 The picture shows a microscope image of the mousse at 400 x magnification. Although I've deliberately chosen a region with extra few bubbles for the picture, the amount of air bubbles is generally low, which explains the dense texture of the mousse. Increasing the amount of water/ginger extract results in the mousse being more liquid (less viscous). When the amount of water is doubled you get a thick creamy sauce with many more and larger air bubbles (a version is worth a try in its own right, really). Long storage, say more than 12-18 hours, results in the mousse starting to "dry out" along the rim. For storage, collect the mousse in a small heap and cover with plastic. chocolate, both from my personal preferences and from a hypothetical/theoretical perspective, see the food pairing web site. Slicing the ginger gives a clear extract rather than a cloudy one which is the result if the ginger is grated. The latter gives slightly more bite, but at the same time (seemingly) a somewhat grainy mousse, see upper picture. Why this happens I don't know. One guess might be that the solid material from the grated ginger might disrupt the emulsion or take hold of some of the emulsifiers (most importantly lecithin) in the chocolate. Unfortunately, the producer is not willing to give any more information on the ingredients. White chocolate mainly consists of cocoa fat, sugar and dried milk (technically not real chocolate since there are no cocoa solids). The reasons that the chocolate-water mixture does indeed give a smooth mixture is thanks to the milk solids (mostly proteins) and added lecithin. This specific recipe has been tested at least three times with the same result every time, one of which was done successfully by our 13 1/2 year old son. If someone should experience that the recipe does not work as expected I'd be very happy to hear about it. I really want this to be a recipe that can be trusted. This, H. "Formal descriptions for formulation" Int. J. Pharm. 2007, 344 (1-2), 4-8. - Hervé This, INRA page: "Vous avez dit Chocolat Chantilly?" - Andreas Viestad, Washington post, "The gastronomer": "Like Water for Chocolate"
Nice combination! I dislike the combination of very dark chocolate and ginger and prefer it with white or ligheter chocolate. However I´d use crystallized gigneger and grate it finely for a better more citrusy flavour. Thanks for the tip. I'll certainly try it next time (these blog posts function like recipes for me now). A note on dark chocolate + ginger: in fact, a Norwegian chocolate producer (well, now American...) has a dark premium version with ginger and lemon. That one has crystallized ginger, however. Works fairly well, but no "flavour revelation"
Hi, just one question, when you're making the extract do you cover the pot to stop the water evaporating off or does this matter? No, I didn't use a lid. Note that the water doesn't boil while extracting the ginger. I heated the water and then left the ginger in the hot water just as if you would make any kind of tea. Furthermore, the recipe isn't that precise (I wrote 5-10 minutes steeping time, that's a variation of 100%, right?). So I guess the small amount of evaporation would not make that big a difference when there is rather poor control over the other factors.